https://www.youtube.com/watch?v=u5V_VzRrSBIThe Boring Company hopes to build an underground tunnel system that could support Loop and Hyperloop. Elon Musk said his proposed, high-speed transit systems, Loop and Hyperloop, “will prioritise pedestrians & cyclists over cars,” in a Twitter thread on Friday. “It’s a matter of courtesy & fairness. 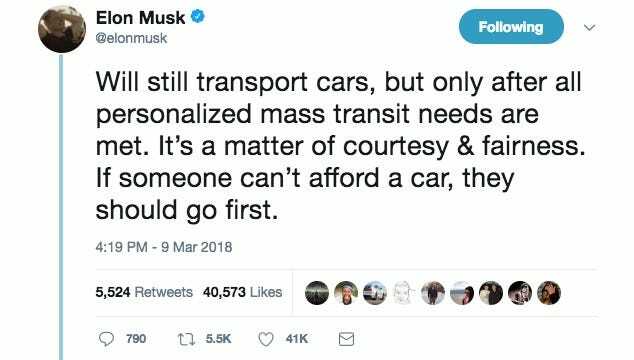 If someone can’t afford a car, they should go first,” Musk said. 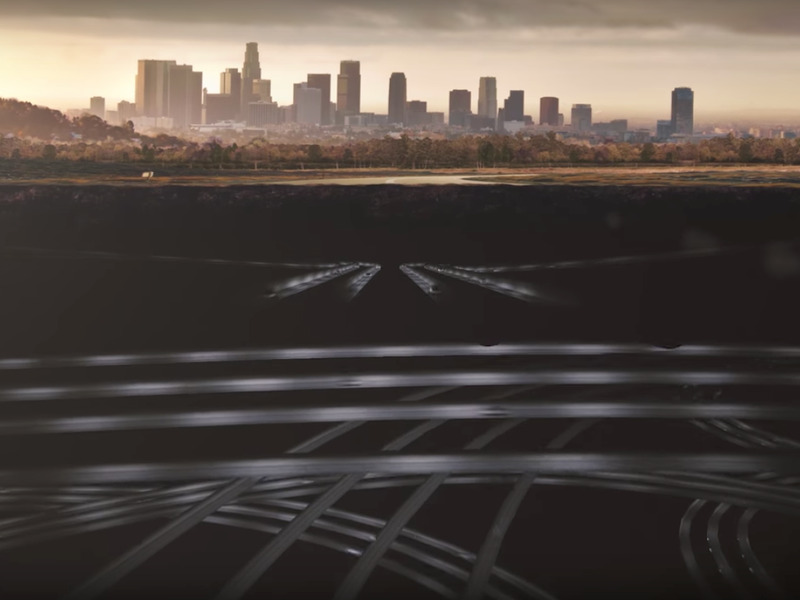 Before either system can become a reality, the Boring Company must receive permission from city governments to build and test the tunnels they would use. Elon Musk’s proposed, high-speed transit systems, Loop and Hyperloop, are designed to decrease traffic congestion and give public transit users a faster option than traditional train or bus systems. 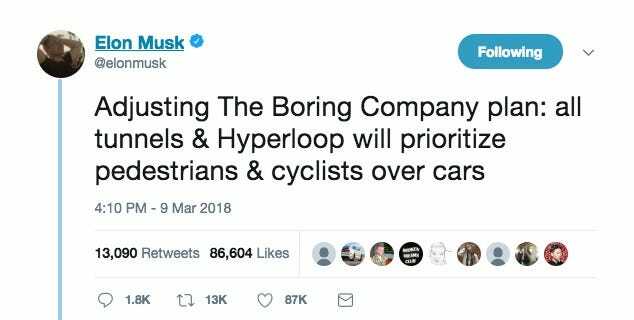 According to a Twitter thread Musk wrote on Friday, the latter will be the first priority for the Boring Company, which Musk founded to build the tunnels necessary for Loop and Hyperloop. Loop and Hyperloop would transport cars and passenger pods on electric skates through underground tunnels. Loop would carry passengers at up to 150 mph, while Hyperloop could reach top speeds of over 500 mph since it would create a vacuum inside the tunnel to eliminate air friction. Loop would likely be used for travel within cities, while Hyperloop would likely carry passengers between them. Aside from speed, both systems would have other advantages over trains. 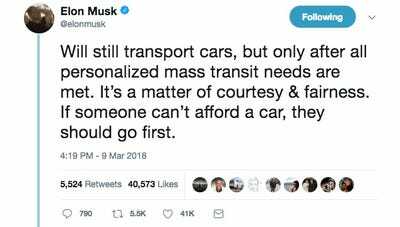 In his Twitter thread, Musk described how Loop and Hyperloop could support a large network of “1000s of small stations the size of a single parking space,” which could allow passengers to board and depart passenger pods closer to their starting points and destinations. Musk wants to build Loop and Hyperloop systems in major cities like Los Angeles, Chicago, New York City, and Washington, D.C., but before they can become a reality, the Boring Company has to receive approval from city governments to build and test its tunnels. The company has already received permission to dig a two-mile test tunnel in Hawthorne, California and a 10.1-mile tunnel in Baltimore beneath the Baltimore-Washington Parkway. 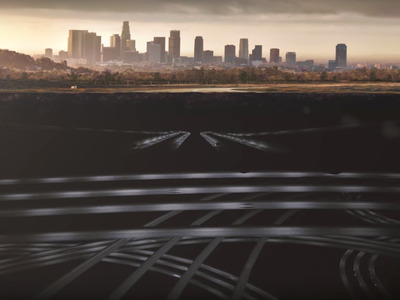 It has also discussed building tunnels in Los Angeles and Chicago.In February, the Boring Company received approval from the Washington D.C. government to begin initial digging and preparatory work that could eventually lead to a tunnel.